IF YOU WANT TO SEE THE FINAL REVEAL, CLICK HERE! Over the years we haven’t shown much of the front of our new home. While we’ve given you a tour of our new front porch and basically a redo for each season, I have to admit that I’m slightly embarrassed by the concrete mess. I hate that we have a huge chunk of our foundation showing. 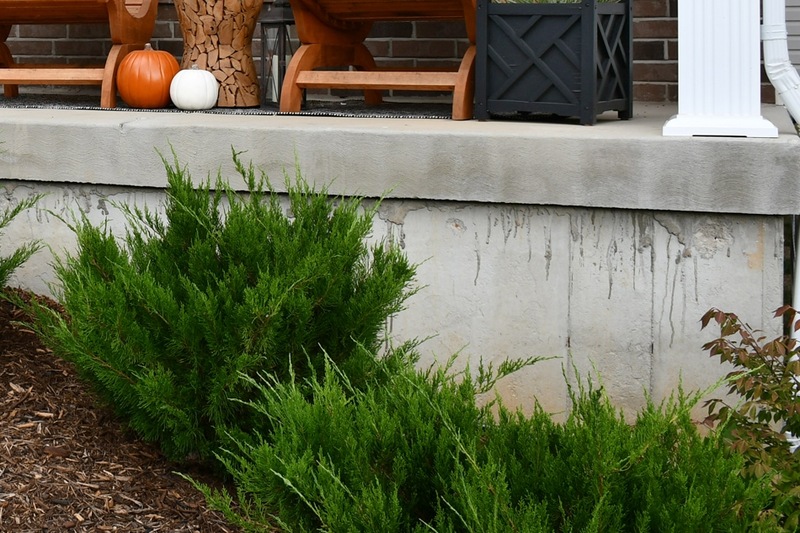 So we’ve been doing a lot of research and are finally ready to tackle the project this Fall with an AirStone concrete foundation wall idea… yep, fake stone veneer. To remind you of what our front porch looked like before, here’s a photo of it from April 2016. And here’s another photo from just a week ago. You can see the bushes are getting bigger (and need to be trimmed) but you can also see the exposed concrete foundation mess. So we had some friends DIY AirStone on the backside of their kitchen island and we totally loved the look. After a little research, we found that AirStone is suitable for outdoor use. Compared to stone, it’s the same look, feel and durability, but weighs 75% less. This allows easy installation of a beautiful stone veneer using only pre-mixed adhesive, a putty knife and a hack saw. No special tools or mixing are needed. Simply apply adhesive to the back of each stone (think icing a cupcake, not buttering toast), and press to a wall. AirStone is available in three color blends: Autumn Mountain, Spring Creek, and the new Birch Bluff. It’s also available at most Lowe’s (1165 stores). 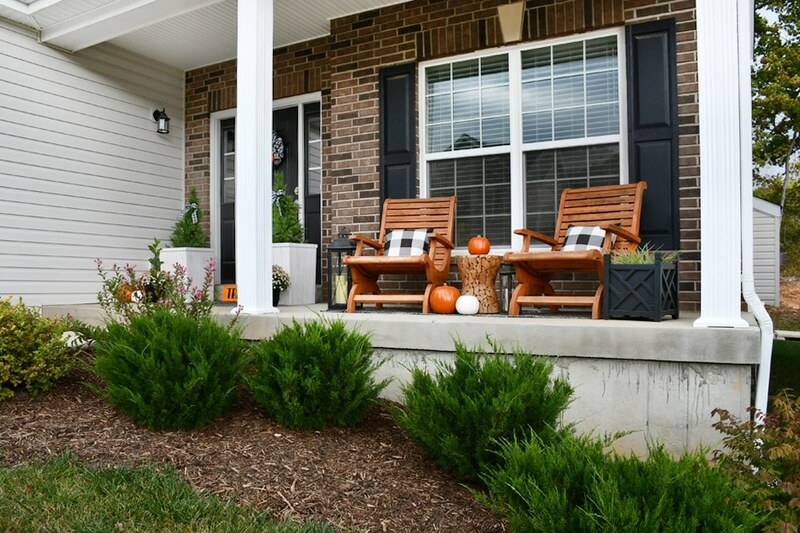 We chose the Autumn Mountain color since our brick has warm colors in it and our siding is a really light creamy color. 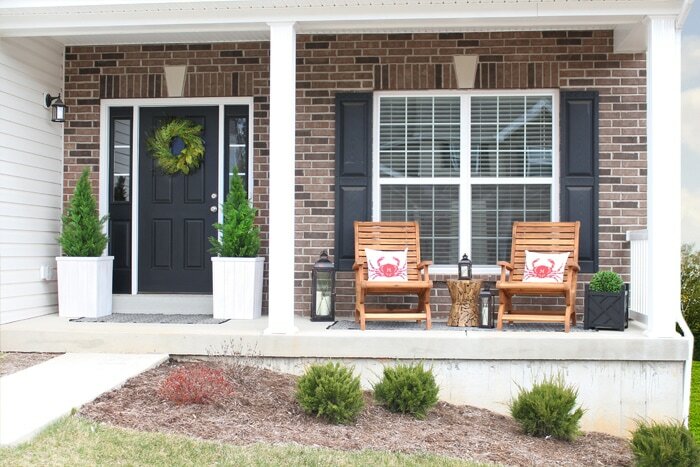 We almost went with Birch Bluff, but I think the Autumn Mountain will contrast nicely with our front porch concrete. So with the help of my best friend (Photoshop), I put together a little gif of a before and after concept for the AirStone concrete foundation wall. Pretty cool, right? So in the next few weeks we’ll be finding an afternoon to complete this project… around our busy Fall schedule of soccer games, volleyball games, birthday parties, and whatever else is thrown our way. If you’ve used Airstone before, let me know your thoughts and the project you completed! Would love to hear your experience before we start on our AirStone concrete foundation wall. And if you’re thinking about using the product, check out the AirStone Inspiration page. I like it…good call to fill in that space! What about wrapping porch posts in it as well to tie it all together? Maybe also the mailbox post and/or some planters for the sides of your garage? I am familiar with the product as I had bought 2 boxes of airstone, but returned it about 18 months ago. I was going to cover a built in trunk in our mudroom, it was too thick for that project. Love the idea about wrapping the posts! We’ll have to see how this first project goes with Airstone. I’m excited to try it out!! That will be so nice looking! As soon as I saw the Birch Bluff color, I thought of my fireplace. That would look really good! Hope it will work out! I think we’re going to try to install it this weekend since it should be nice out. Will keep you updated!! I’ve considered this look for my fireplace. But I didn’t realize this product existed and we had a lighter, easier option. We will be redoing it soon and need to cover tile and I think this will be great. Can’t wait to see how your project turns out! I’ve seen this over fireplace tiles before and it’s GORGEOUS! Hoping to work on this project over the weekend. Will keep you updated! Hi. I am eagerly awaiting the Airstone installation. Airstone might be a product that I could use for my foundation. I would like to know if it was easy to install and did the “stone” adhere as easily as is described? Thanks! We are putting it up this Saturday!! Supposed to be warmer here… didn’t want to install it outside when the weather was too cold. Stay tuned! !